My friend Jenny and I went to the Spring into the Future Tour at Books & Books Sunday, May 28th and what an amazing time we had!! 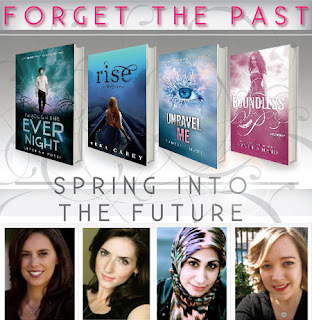 We were so lucky to meet Tahereh Mafi, Anna Carey, Cynthia Hand and Veronica Rossi!! What an amazing group of funny and talented ladies. If you follow me on Twitter you were being updated on all that was being discussed. Some of which was exciting news! Tahereh is going to write a Novella (due in December), which she hasn’t started, but (fingers crossed) will be out before the end of the year! TEAM WARNER!! 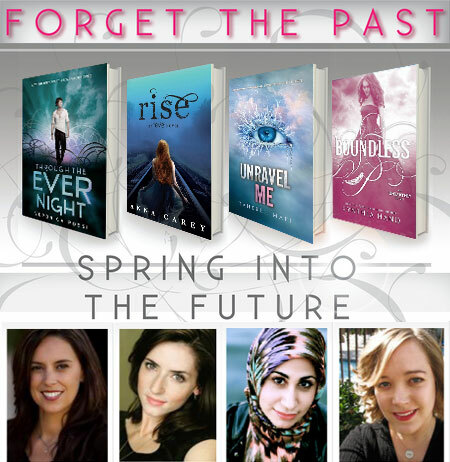 Some more exciting news is that Veronica and Tahereh will both be at BEA this year. So if you are going, make sure you go and check them out! Cynthia Hand is working on a contemporary stand alone with a bit of a supernatural twist, she couldn’t say more about it, but I am very excited. So for all of us Cynthia Hand fans out there, I am sure you are stoked about that as I am. But wait, there is more! Anna Carey is also working on a new series (3 books) about a girl who loses her memory and tries to figure out what happened. Sounds pretty cool – I can't wait! I brought the girls cupcakes from a bakery here in West Palm and I think they were a big hit. Look at the pictures and YOU tell me. LOL There are plenty of pictures so I hope you enjoy! I love finding new books and new authors! This is a great site and I can't wait to explore more! Team Adam, ALL the way! !